There has been much discussion and attention paid recently to women and STEM careers. Rather than continue this conversation in general terms, I thought it would be helpful to take a look at specific STEM industries in which women are underrepresented to highlight some of the opportunities for women and as well as the challenges. Aerospace is the first industry I’m exploring relative to these issues. Susan Chodakewitz, President of Tetra Tech, believes that the opportunities for women in the aerospace industry are limitless from both a technical and management/executive perspective. I asked Susan about the current representation of women in aerospace. 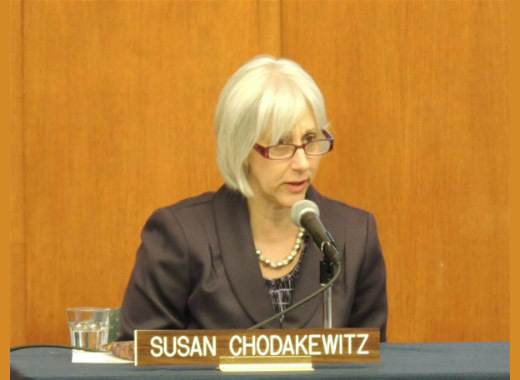 Susan Chodakewitz: I think it’s important to note that, to start, the percentage of women in aerospace has definitely held steady for over 20 years. Second, if you talk about aerospace at the highest level – the high-water mark that I can see is, 25 percent in the field are women. But when you drill down further, the numbers drop off significantly. For example, it looks like, in 2012, only about 10 percent of aerospace engineers and computer network architects were women. Only 16 percent of the aircraft, spacecraft, and manufacturing subgroup within aerospace are women. So, the more technical you get, the numbers drop significantly below that 25 percent. Marcus: Of the 25% that are women, what type of jobs do they have? Chodakewitz: Most of the 25% is in the non-technical and non-executive roles; in supportive functions such as administrative, program management and finance. Marcus: When you say the opportunities for women in aerospace are limitless, are you speaking overall or in technical areas? Chodakewitz: Well, I am talking about overall, including the technical areas. A couple of things need to happen to realize that the opportunities. Because, clearly, women have to want to move into this field; they want to have to stay in the field. And we have to dam up the leaky pipeline. But, when you think about the projected growth of jobs in STEM, the US economy and the government and corporate leaders are going to have to expand the universe of pipeline to fill these jobs. STEM jobs are likely to grow about 17 percent between 2008 and 2018. Non-STEM jobs will grow less than 10 percent in this same timeline. All managers, all companies, all entities are going to have to do something different – to ensure that, they’ve got the quality and numbers of employees – to fill this increasing need. And, to me, women, who are almost 50 percent of the workforce, across the board – but, so underrepresented in aerospace – have to represent a good part of that answer. Marcus: Why do you think more women aren’t attracted to this industry?